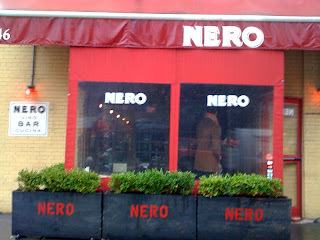 We had great brunch on a rainy Saturday at Nero, an Italian restaurant, in the Meatpacking District. We actually ended up here by default since we tried to go to Pastis first but it was way too crowded and a one hour and a half wait. At Nero, we were surprised to able to get a table immediately. This is one of the best pancakes I've tried. 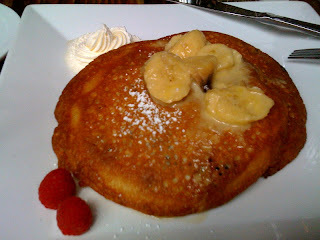 This is their chocolate pancake with rum-covered bananas (although I didn't taste any rum). The pancake was thick and fluffy with a nice crispiness on the edges. The chocolate was evenly dispersed throughout and wasn't too sweet. 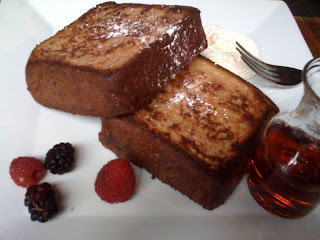 And check out these thick slices of French Toast. They were just the right kind of food after you've rolled out of bed late on a rainy day. Nero is dark and rustic with its brick walls, wooden tables, and minimal lighting. It created an atmosphere that made us feel like we were having brunch at 9:00 PM, which would have been just fine with us because breakfast food is always the best the later you have it.